Climate change on social media: what do we know, what do we see, what do we do? Grantham Supervisor Dr Warren Pearce works at iHuman (Institute for the Study of the Human) at the University of Sheffield, where he researches the intersection of science, policy and publics. 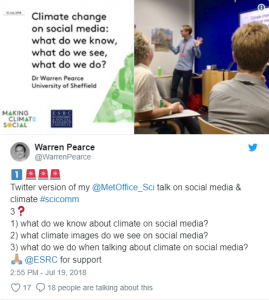 One of his areas of expertise is climate change communication and he recently gave a talk at the Met Office examining how climate change is discussed on social media.